Rise: Social Confidence for The New Generation - Finesse Worldwide, Inc.
Enroll your K – 12th graders in one of our “Rise: Social Confidence for The New Generation” classes to help them increase their self-confidence, reduce social anxiety, refine their table manners, and help them understand the importance of electronic etiquette and showing kindness and respect to others. UPDATE! 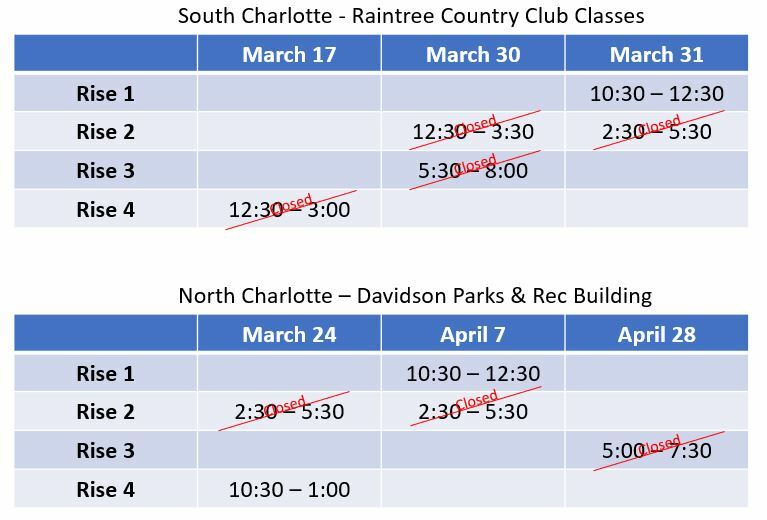 Classes with availability are only the Rise 1 classes in South and North Charlotte, and the Rise 4 class in North Charlotte. We will announce the fall class schedule soon. Please email aimee@finesseworldwide.com for more information or register for our newsletter to be notified of new class dates. Children in grades K – 12th can participate in one of our four Rise: Social Confidence for The New Generation classes in either the south or north Charlotte areas. The previous, Impressions: A Modern Cotillion for The New Generation, is now called, “Rise 2”. Plus, we are offering two options to participate in this program. 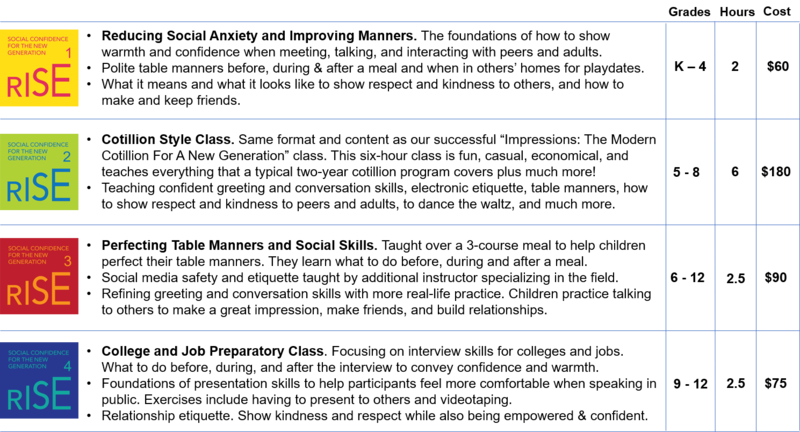 Rise 2 – Standard Class. Participants attend one two-hour class every other week for three weeks. Rise 2 – Weekend Intensive: Participants devote one weekend and attend three hours on Saturday and then three hours on Sunday. See below for the class locations, types, dates, descriptions, and additional information. All classes teach modern manners for this generation, are very interactive, fun, and include group activities and hands-on learning. CLICK HERE TO REGISTER FOR ALL CLASSES. Instruction and practice on how to politely and confidently interact with others in person and when using electronics which helps them feel more self-assured and socially confident. Materials to use in class and to take home. Food and beverages appropriate to the class. The Rise 3 class is over a 3-course meal with two options of entrée, appetizer and desert to choose from. Games, activities, prizes and materials for learning purposes. Rise 1 and 2 culminate in parents attending a portion of the class to watch the children demonstrate what they have learned and to ask the instructor questions. All classes are taught by Aimee Symington, CEO of Finesse Worldwide, etiquette expert with over 15 years’ experience teaching children and adults worldwide. Refer a Friend. If you share the information about the classes with a friend and he/she signs up, you will BOTH receive a $10 credit for the class. Keep referring and getting credits! Just remind your friend to write your name on the registration form and you will both be credited after registration. Loyal Family Program. If you have had a child attend a previous etiquette program, you will receive $20 off your new registration. Write your child’s name in the correct field on the registration page and you will be credited after you register.